Tasmania, an Australian Island located 150 miles south of the continent has a total land area of over 35,000 square miles and a population of over 500,000. It is believed to have been inhabited by Tasmanian Aborigines as far back as 35,000 years ago. The name comes from the Dutch explorer Abel Tasman who was the first European explorer to see the Island on 24th November 1642. The Island was named Van Diemen’s Land at the time, a reference to Anthony van Diemen who sent Tasman on his voyage of discovery. It was colonized and made part of the British Colony of New South Wales for use as a penal colony in 1803. 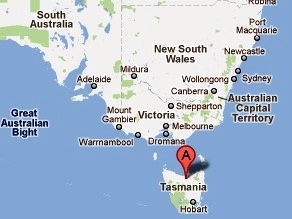 The Island became the separate British Colony of Tasmania in 1856. The Island became the present Australian state of Tasmania in 1901 when Tasmania along with five other British Colonies united to form the Commonwealth of Australia. The first stamps of Tasmania were a set of two stamps in separate QV designs. The unwatermarked Imperforated stamps have the ‘Van Diemen’s Island’ inscription instead of ‘Tasmania’. The stamps (Scott #1 and #2) are very rare and valuable cataloging in the $8K range for Mint and the $1.8K range for Used. There are more common Used cut-to-shape varieties of these issues that catalog in the $17 range. A Chalon Head common design QV issue followed in 1855. That set (Scott #4 to #6) is also very rare cataloging in the $11K range for Mint and $1.8K range for Used. Several varieties of the same Chalon Head design appeared during the period till 1858. A Chalon Head design with a hexagonal frame appeared during the period from 1858 to 1867. That set (Scott #14 to #16) catalogs in the $1.8K range for Mint and around $250 for Used. Other QV designs and certain overprints dominated the Tasmanian stamp issue scene during the period till 1899. Many of these early issues catalog upwards of $100 although certain lower denominations can be had for a few dollars. Tasmania released a beautiful local scenes set between 1899 and 1900. The set (Scott #86 to #93) catalogs for around $165 Mint and around half that for Used. The designs show Lake Marion, Mount Wellington, View of Hobart, Tasman’s Arch, Spring River of Port Davey, Russell Falls, Mount Gould and Lake Saint Clair, and Dilston Falls. Tasmani continued to issue stamps till 1912 when stamps of Australia replaced Tasmanian stamps. Several private token coins were used in Tasmania from the mid-nineteenth century onwards. Prominent ones include Copper Pennies of Lewis Abrahams of Hobart, Joseph Brickhill of Campbelltown, E.F. Dease of Launceston, J.G. Fleming of Hobart, I. Friedmand of Hobart, O.H. Hedberg of Hobart, R. Henry of Hobart, Samuel Henry of Deloraine, G. Hutton of Hobart, William Andrew Jarvey of Hobart, R. Josephs of New Town, H. Lipscombe of Hobart, Machintosh & Degraves of Hobart, H.J.Marsh & Brother of Hobart, R. Andrew Mather of Hobart, A. Nicholas of Hobart, R.S. Waterhouse of Hobart, Thomas White and Son of Westbury, W.D. Wood of Hobart, etc. The tokens in VF fetch upwards of $25 depending on rarity. Some Silver issues (example – Macintosh & Degraves Silver Shillings of 1823) and certain Copper coins (example - A. Nicholas Copper Pennies) are very rare and sought after cataloging into the 1000s of dollars range. Historically relevant postcards from Hobart, 18th and 19th century original antique maps, authentic aboriginal pieces, etc are good collectible items of Tasmania.